It was just like a fairy tale. Her simple beauty, intelligence, and gentle bearing won the Tsar over. The court was shocked by the news that the Tsar had chosen a servant girl to be his bride. In spite of all the protests, Michael Romanov insisted. Now came the difficult part . . . Sometimes, truth really is stranger than fiction. Take the story of Cinderella, the quintessential rags to riches story, the golden standard of the “fairy tale ending.” Well, believe it or not, Russia had a historical Cinderella story, and at the highest levels of government. The setting, the characters, and the ending are almost too perfectly plotted to be historical. What follows is my translation of a Russian original that you can find here. Russia, wounded and barely alive, had just emerged out of the most difficult period of its history. This “Time of Troubles” saw not one, but two “False Dimitri” tsars and Rus’s ancestral enemy, Poland, occupying the throne of Moscow. The capital city itself burned almost to the ground. Only by the slimmest of margins did a liberation army, under the command of a brilliant, self-effacing leader, manage to drive away the invader. After the entire country unified to choose a new Tsar, Michael, the son of the Patriarch of Moscow Philaret, it seemed things might finally be on the mend for the beleaguered country. But the specter of internecine war seemed to loom again when Tsar Michael was still unmarried at the ripe old age of thirty. His father, Patriarch Philaret, couldn’t arrange a wedding for his son, since he was languishing in a prison in Poland. So the job fell to the Patriarch’s former wife, the nun Martha. (Why were the Tsar’s parents both monastics? That’s a story for a different day. But yes, it had to do with political intrigue, not a vocation to serve the Lord). In 1626, under the direction of Nun Martha, official decrees were sent to all Russian cities about the Tsar’s need for a bride. She needed to be of a noble family, beautiful, intelligent. Also considered necessary were tall height and good health (both apparently indicative of the ability to bear strong male heirs). Any and all who fit the bill were to report to the capital posthaste. It wasn’t easy for prospective brides to get into the exclusive “viewing of the bride” (see more on Russia’s odd and fascinating wedding customs here). After undergoing what was effectively and old-time beauty pageant, only sixty young ladies were deemed worthy of the private viewing with the Tsar himself. However, Tsar Michael, who was no slouch, did not find any of the sixty to be quite right. Half-legendary history tells that the Tsar couldn’t see any natural beauty among them, since all of them were so carefully made up and dressed to the nines. So his mother offered to set up a secret contest to find the true beauty among them. In the middle of the night, after everyone had fallen asleep, the mother and son walked with a candle through all the rooms of the sleeping brides. No makeup, no fancy hairdos, no hiding behind layers and layers of fancy clothing. And the Tsar made his choice. His choice surprised everyone. She was not even one of the sixty chosen candidates. Nor was she noble born. She had come to the Tsar’s palace as a servant to one of the sixty! The court was shocked by the news that the Tsar had chosen a servant girl to be the Tsaritsa of Russia. But it was just like a fairy tale. Her simple beauty, intelligence, and gentle bearing won the Tsar over. In spite of all the protests and the complaints of the boyars and even Nun Martha, Michael Romanov insisted. Now came the difficult part. The boyars, though they had just been punished severely for it by the Time of Troubles, couldn’t quite part with their instinct to intrigue. The young lady, Evdokia Streshneva, had to be guarded night and day. After all, it wasn’t unheard of for brides, in the weeks before their weddings, to develop strange maladies that proved them “unfit to bear children.” Sometimes it was a paid-off doctor, sometimes a cook who slipped something nasty into the young lady’s food. So Tsar Michael decided to dispense with formality completely. He married her three days after their announced betrothal. 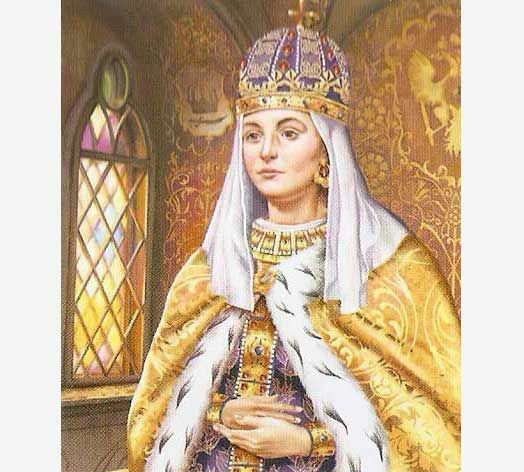 And it was this young lady, so removed from the nastiness of courtly intrigue, who gave birth to Tsar Alexei Mikhailovich, one of the most brilliant rulers Russia would ever have.